Now through April 30, 2017, get a $25 rebate per gallon of Phyton 27 or Phyton 35 — a great time to try them in your greenhouse. In the greenhouse, March can get, shall we say, a little crazy? With temperatures heating up and the gardening season about to kick into high gear, growers are scrambling to get their bedding plants ready to ship to meet spring demand. The stakes for growers in this game are just as high as they are for college basketball teams seeking the title: a profitable spring season could make all the difference in a grower’s annual bottom line. This is where the grower might want to take a page out of the basketball coaches’ playbook, namely, teaching the team that the best defense is a good offense. Growers face tough disease opponents that are stubborn, strong, and determined to win. To defeat them, growers must maintain control of the “court” and never, ever give them the “ball.” Because, unlike sports, there are no referees to call foul, and any mistakes could prove fatal to a grower’s crops. 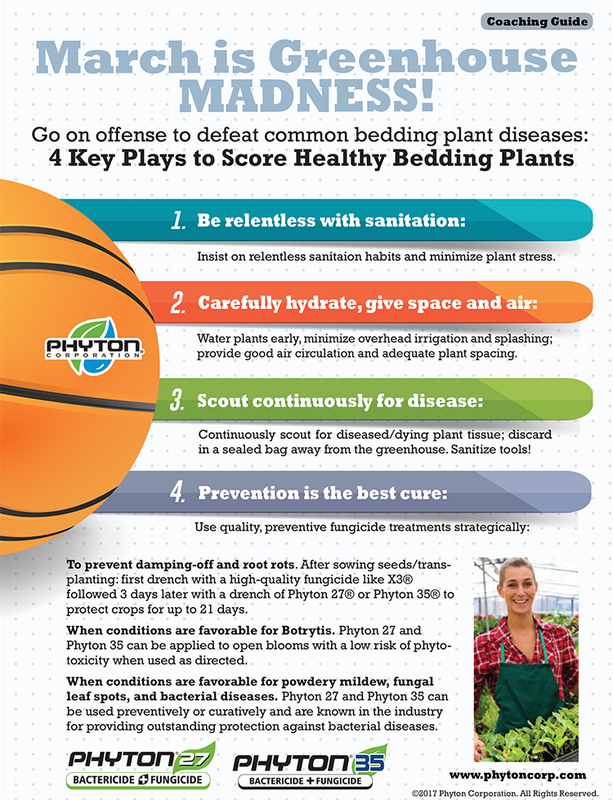 Download our colorful “coaching guide” to help everyone on your team defeat bedding plant diseases this season. Designed to fit a letter size sheet of paper, you can easily print and share it. While you’re at it, pick up a gallon of Phyton 27® or Phyton 35® — they’re both great team players in your rotation line-up. Take advantage of our rebate offer: now through April 30, 2017, save $25 on every gallon you buy. Now go out and knock ’em dead! Get a $25 rebate per gallon of Phyton 27 or Phyton 35, now through April 30, 2017.